Siddartha Gautama, the man known to history as The Buddha, was born in Northern India (modern-day Nepal) in 563 B.C.E. He was a prince and the son of King Suddhodana and Queen Maya. The Buddha-to-be grew up in a world of privilege and seclusion from the suffering of the world. This was ordered and ensured by his father after the prophets in his court told him that his son would either be a great king who would rule the world or a great world-savior. The prophet informed the king that his son would be the latter, if he was exposed to human suffering. The king did all in his power to prevent his son from exposure to anything that would interfere with his son becoming a great ruler. While in his late 20s, Siddartha witnesses an old person, illness, and death for the first time in his life. He is greatly dismayed, realizing that he too was subject to these forces. Then he encounters a holy man and he immediately understands that if these terrible things exist in the world, there must be a way to overcome them. He decides to leave his princely life in search of a way to overcome these human difficulties. After studying under a variety of teachers, Siddhartha attained enlightenment at the age of 35. He planted himself beneath a Bodhi Tree and vowed not to rise from the spot until he had discovered the ultimate truth. The rest is history, as they say. 2500 years later 376 million human beings adhere to the Buddha’s Middle Way and The Noble Eightfold Path; making Buddhism the 4th largest “religion” in the world. However, if you include “cultural Buddhists” there are probably more Buddhists than any other religion on the planet. 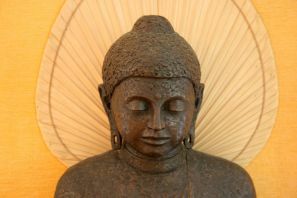 The Buddha himself is revered as a shining example of human potential, determination, and possibility. His practices and teachings are the basis for many relaxation, visualization, and self-improvement techniques. Here are some affirmations for Buddhists and those interested in adopting a Buddhist approach in their life and thinking. Today I am happy. Today I am peaceful. Today I am free from suffering! Today and every day, I am committed to my meditation practice. I practice Metta everywhere I go and in everything I do! Today my inner lotus blossoms, as I release attachments and turn my face to the sun. Today I find the pearls of my enlightenment scattered along my path. Today I seek enlightenment. Today I experience enlightenment. Today I am enlightened. Today I release my attachment to the transitory circumstances and appearances. The great teachers of the past showed me the way and today I am making the effort to follow their path. Today I clearly see the beauty in a flower and my whole world changes. I work diligently to make peace, love, and compassion my way of life. I take refuge in the Buddha. I take refuge in the Dharma. I take refuge in the Sangha. Nirvana is mine when I have the strength to choose it. Today I am practicing right view in all my thoughts, words, and actions. Today I am practicing right intention with all my thoughts, words, and actions. Today I am practicing right speech with every word I say. Today I am practicing right action with everything I do. Today I am practicing right livelihood in your job and in all your career choices. Today I am practicing right effort with all my thoughts, words, and actions. Today I am practicing right mindfulness with all my thoughts, words, and actions. Today I am achieving right concentration during my meditations. As love grows within me, my hatred goes away. Breathing in, I feel peace. Breathing out, I am peace. My path is peace. My mind is peace. My life is peace. This list will continue to grow. Please leave a comment offering suggestions for other areas of Buddhism where I could add affirmations. Wishing you a day filled with loving-kindness and joy. Please visit my YouTube channel to watch a guided meditation with affirmations that support your practice The Noble Eightfold Path. You can also download an audio version to listen to while you workout here.